My name is Tuxedo and this is my debut children's book. I am a Criollo horse, originally from Argentina, but I was rescued by my Mum and bought back to the UK from Malaysia. Tuxedo's Tales will take children on a magical adventure spanning a year in the Sussex countryside. They will learn new words and their meanings, and appreciate how important family and friendships are. At the end of each chapter is a Pearl of Wisdom which will teach good behaviour, respect and consideration, as well as a few of life's ethics and morals. "The other thing is, I'm a real horse - I do exist." Tuxedo is alive and kicking enjoying his retirement being cuddled, groomed, going for leisurely rides and enjoying lots of carrots. "So, enjoy my tales of adventure and meeting my countryside friends, I hope you enjoy reading it as much as I did writing it." The book includes lots of beautiful colourful illustrations by Katie Tunn. Think of characters with kind eyes, soft coloured drawings; think of a modern-day Beatrix Potter and you have Tuxedo's Tales - a unique children's book for those aged 5-9 years old. 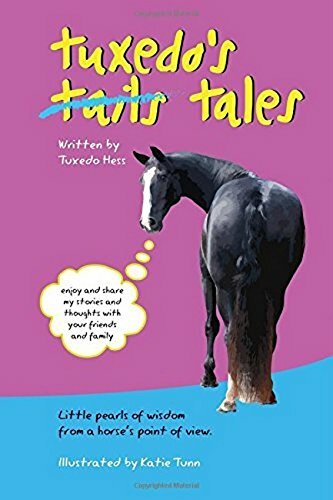 As Tuxedo was rescued, a percentage of the profits of Tuxedo Tales will be going towards Horse Welfare so they can help other horses to have a happier life.